Above and bottom: Tony and Elizabeth Ruiz and their children, Zed and Evie. Photos by Mellisa Misner. "Customers appreciate it when they come in, ask if I have Dijon mustard, and I say 'No, but I can make you some.'" After the flood, which destroyed the farm where they grew much of the fresh produce they sell last August, the Ruizes stepped up their game. The local supermarket down the street, Freshtown, had closed because of flood damage. (It reopened earlier this month.) 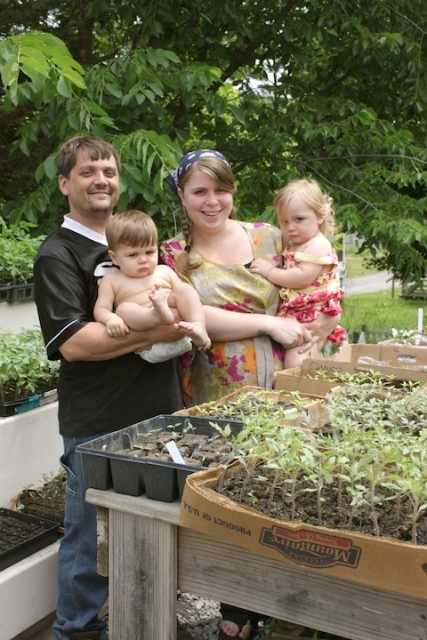 Because of that, for most of the past year, Greatwoods Farm was one of only places in the area to get fresh local food. The young Ruiz family devotes long, hard hours to the store. Tony is up at the crack of dawn every day, baking bread, cakes, pastries and soups from scratch; he concocts sauces, dips, soups, condiments, marinades and dressings to order. Greatwoods Farm encourages their customers to buy beans, pasta, flour and grain in bulk which, as any frugal shopper knows, is a much more economical option. "You can get a higher quality at a lower price," says Ruiz. But for those shoppers who are used to their favorite brands, Greatwoods also stocks processed staples like Smuckers and Skippy, juice boxes and cereals. They have large walk-in fridges with free-range chicken, dairy, seasonal vegetables and a freezer full of grass-fed local meat. Watershed Post: Hurricane Irene destroyed your farm in 2011. How close are you to getting that land back again? Tony Ruiz: We're not, actually. That was leased land, and we're not pursuing the rebuild of that one. We're actually borrowing land in Margaretville. We're going to get started on the farm there pretty soon. This year, we're trying organic brown rice. WP: And you've had a lot of people coming to you and saying that basically, you're a lifesaver? TR: A lot of people say that, but I'm not really comfortable with it. There are also people who say that we don't have what we should have, or we have too much so our store is cluttered and it is. WP: Who cares that it's cluttered? TR: I guess we've been trained to look for the supermarket ideal where there's gleaming Formica, everything packaged in its own colorful packaging, and now we're going back a hundred years where we're taking things out of a brown sack and putting it into a brown paper bag for you to take home. A lot of people don't feel comfortable with that. WP: People forget about their history. This is what a grocery store used to look like. TR: Back in Victorian times, produce was sold from behind the counter while patrons shopped on a certain day periodically and asked the grocer for what they wanted and it was handed to them. You were served and you had a particular time when you came in and shopped. If you don't see what you want here, you're encouraged to ask. We like to serve and stock pretty much everything here behind the counter. And if we don't have it we will order it for you. You may not get the brands that you want, but at this point we can offer you almost anything that a conventional store stocks. Since we don't offer twenty different types of salad dressings, we make them to order. Elizabeth Ruiz: And Tony even makes his own tahini to use in our homemade hummus. It's actually very easy to make: sesame seeds and some oil. WP: How much notice do you need to order, say a leg of lamb? TR: Usually I can get lamb overnight to two days. If you want a whole lamb: same thing. If you want me to stuff that lamb with a stuffed turkey that's been stuffed with a chicken, that's been stuffed with a partridge or something, I'll need a little more notice. WP: What's the future for you? TR: Buying our own farm. We'd also like to increase the size of the store. We're working on a local organic restaurant. I'd like to have a vegan menu for people; there's nowhere around here to get that. I'd like to have a restaurant that anyone could afford to eat in, that has all local grass-fed beef, local dairy and vegetables in season. We're working on it. If you'd like us to profile your business, email editor@watershedpost.com and tell us what makes your business special. You don't have to advertise with us to be profiled, and being an advertiser does not guarantee coverage. Greatwoods Farm is a Watershed Post advertiser.